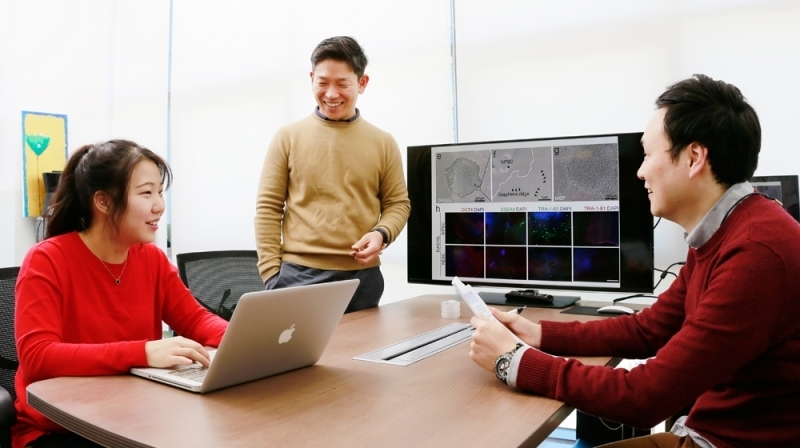 Prof. Jeong Beom Kim (center) is talking with his students, Hyunah Lee (left) and Donggyu Nam (right) at his office. What is shown on the screen is the SEM images of hiPSC cultured on graphene ridges of DAS nanocrystalline graphene. Researchers have long been interested in the technology of cell culture. Although previous studies have introduced stem cell technologies, none of them were able to survive without the risk of pathogenic contamination, until now. 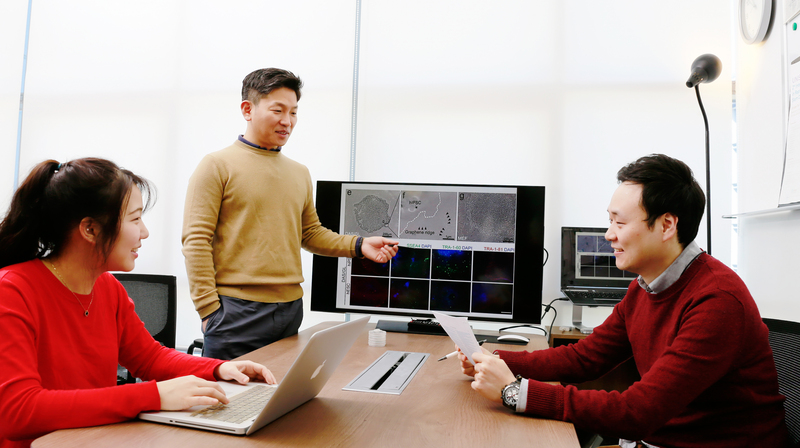 A team of Korean researchers, affiliated with UNIST has made a breakthrough that enables human induced pluripotent stem cells (iPSCs) to grow on graphene. They have successfully developed a new technology to produce iPSCs using nanocrystalline graphene (DAS-NG), which will be ideal for use in clinical trials. This study, appeared in Scientific Reports on February 5, was jointly conducted by Prof. Jeong Beom Kim (School of Life Sciences) and Prof. Soon-Yong Kwon (School of Materials Science and Engineering) at UNIST. In this study the team demonstrated feeder-free and xeno-free culture system for hPSC expansion using diffusion assisted syntesis-grown DAS-NG, a synthetic non-biological nanomaterial which completely rule out the concern of human pathogen contamination. According to the team, this feeder-free and xeno-free culture method is simple and cost-effective in manufacturing process, thereby allowing large-scale culture of hPSC in clinical grade. Hyunah Lee, Donggyu Nam, Jae-Kyung Choi, Marcos J. Araúzo-Bravo, Soon-Yong Kwon, Holm Zaehres, Taehee Lee, Chan Young Park, Hyun-Wook Kang, Hans R. Schöler, and Jeong Beom Kim. “Establishment of feeder-free culture system for human induced pluripotent stem cell on DAS nanocrystalline graphene.” Scientific Reports. 2015.